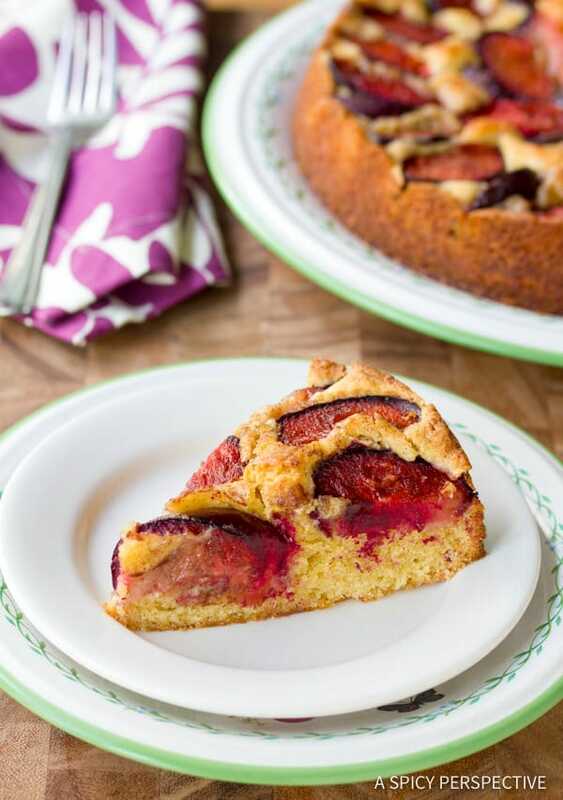 A rustic Fresh Plum Cake is a fabulous dessert option for summer picnics and parties. Serve warm with ice cream! On this particular day the kids wanted to bake! We didn’t even bother changing out of our jammies. We headed straight for the pantry to assess our options. Chocolate chips? No. Shredded coconut? No. Peanut butter? No. What was this kitchen coming to??? All the essential elements for our favorite go-to treats were missing. We took a breath, and regrouped. We had fresh summer plums, butter, sugar and flour. 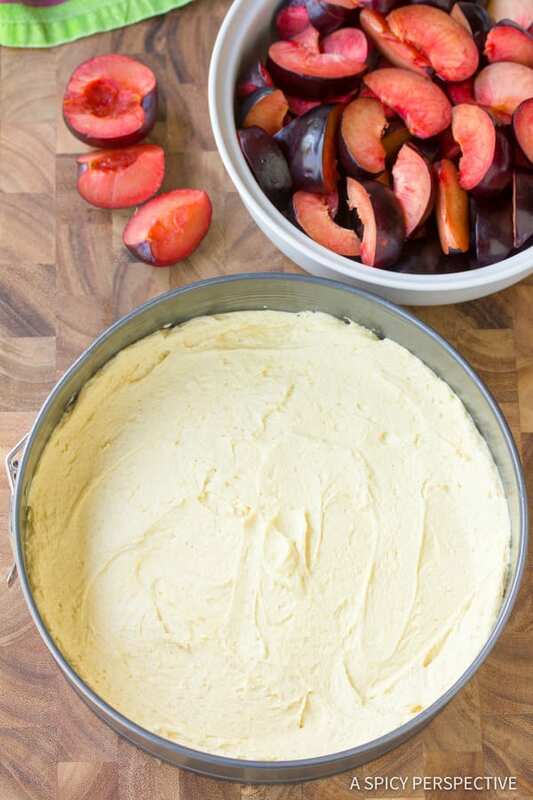 A Fresh Plum Cake in the making. I could tell we were on our way to greatness. Yet it’s nice to teach children some classic, and slightly more sophisticated recipes. They pick up baking techniques quickly and appear to enjoy the mature deserts just as much. Plus, these are recipes they can take with them throughout life; a spring board to greater meals and ideas. A little token of mommy. 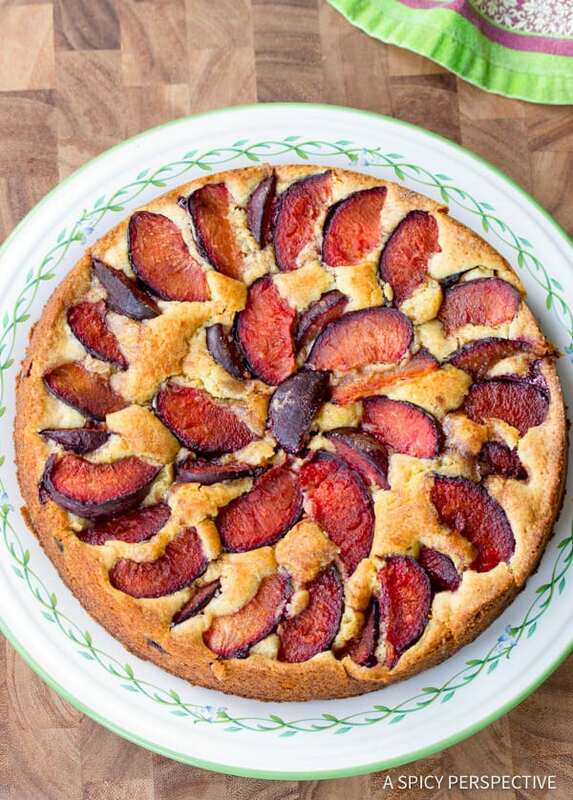 This particular Fresh Plum Cake is great for summer stone-fruits such as plums, peaches and apricots, yet with a rustic quality that carries through to fall. A hearty, yet elegant cake that needs no cream or sauce to perfect it. The plums add a juicy tang to this dense buttery cake, so it’s flavorful enough to stand alone. That makes this Fresh Plum Cake a perfect dessert to take to a barbecue or summer party when stone fruit is fresh and in season. This is just the kind of dessert I’d wrap up and put in my picnic basket for an evening concert at the park. No hassle, big impact. 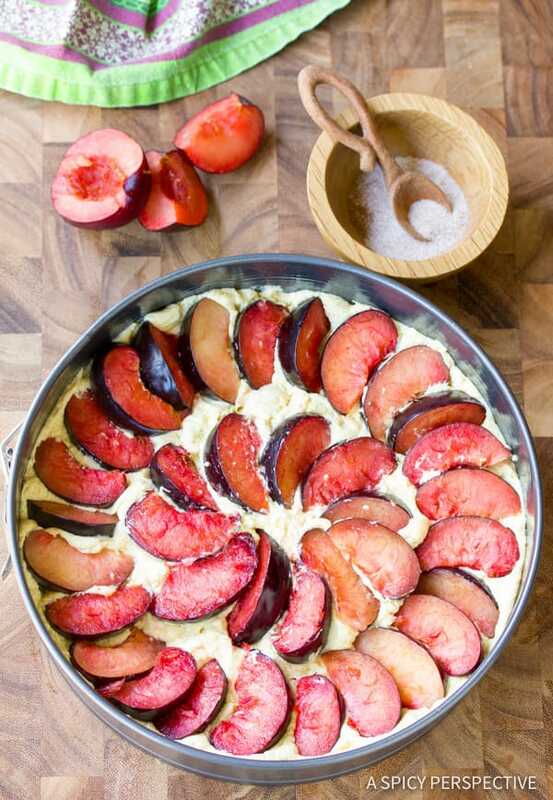 You can also make Fresh Plum Cake, with peaches or apricots instead of plums! Fresh Plum Cake - A rust yet elegant cake that is easy to make and easy to love! Serve it in the summer with seasonal plums, and around the holidays. 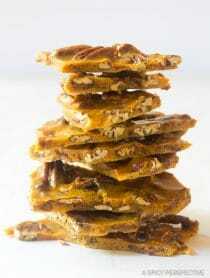 Preheat the oven to 350 degrees F. Place a sheet of parchment paper over the bottom disk of an 8-9 inch spring-form pan. Fasten the ring around the disk with the parchment paper secured in between. Cut off the excess paper. Grease the sides of the pan. Whisk together the flour, baking powder, salt and 1/2 teaspoon of pumpkin pie spice. Spread the batter evenly in the prepared pan. Slice the plums into eighths. The easiest way I’ve found to do this, is to run a knife around the plum to halve it, then do the same to quarter it. Split each quarter in half. The little sections should pop off the pit with your knife. Place the plum slices around the top of the cake in a pretty pattern. Make sure they are close together. Sprinkle 1 tablespoon of sugar and the remaining 1/4 teaspoon pumpkin pie spice over the plums. Bake for 45-55 minutes, until a toothpick inserted into the center comes out clean. Make SURE not to over bake! Cool for 15 minutes in the pan, and another 10 minutes out of the pan before serving! *Try with fresh summer peaches, nectarines or apricots! Perfection. Used fresh plums I had frozen from the Summer. Let them dethaw and used juice to make a syrup to go on top of ice cream. Cake was perfectly moist. Company loved it and it didn’t take long to make. Just took my first bite out of a warm piece of this delicious plum cake. I used a 10 Inch Springform and 7 plums . Awesome – this is a keeper ! 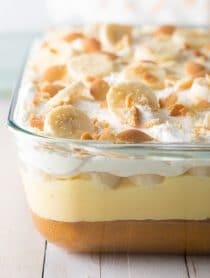 This is in my oven baking as I comment! It smells so yummy and the batter was delicious so I’m sure it isn’t going to be fantastic! Thank you for the recipe!! 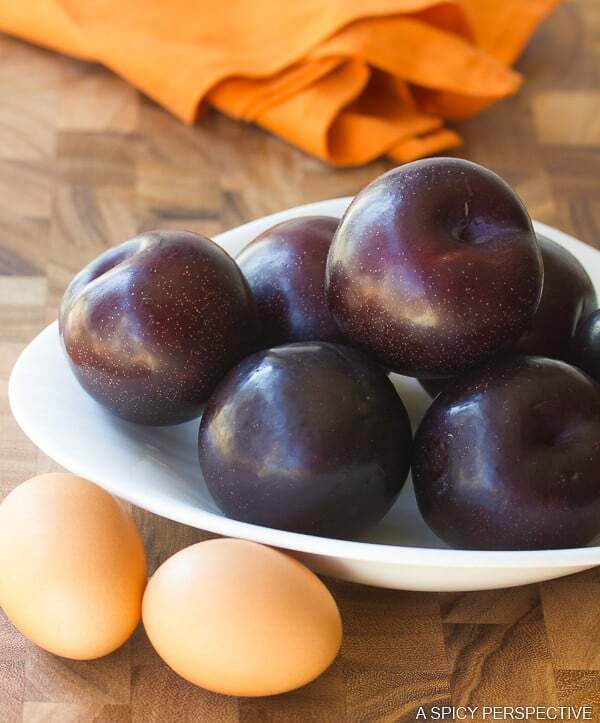 I was just wondering if anyone has tried it with frozen plums (like buy fresh but cut and freeze the slices of plum)! I just make the cake, had to use canned plums as its winter here and none available! Served it with home made yummy custard and Tip Top vanilla pod ice cream and it all disappeared! Thank you for the brilliant and easy recipe! Delicious! I love plums and your patience to bake with the kids! What a fabulous cake – love this! Your summertime routine sounds exactly like ours. I agree that there is something to be said for teaching kids to appreciate the classic desserts. This plum cake is beautiful! Hey! I made this sometime ago, except mine was an eggless version and I did an upside down take on it. And yet, it looks so much like yours! :) Your kids are so adorable! I can’t wait for mine to grow up so I can bake with them! That is one beautiful cake!! Your cake looks so delicious with the pretty design of plums on the top. This would be perfect for my Sunday brunch. Your photos are lovely and your kids are just precious. 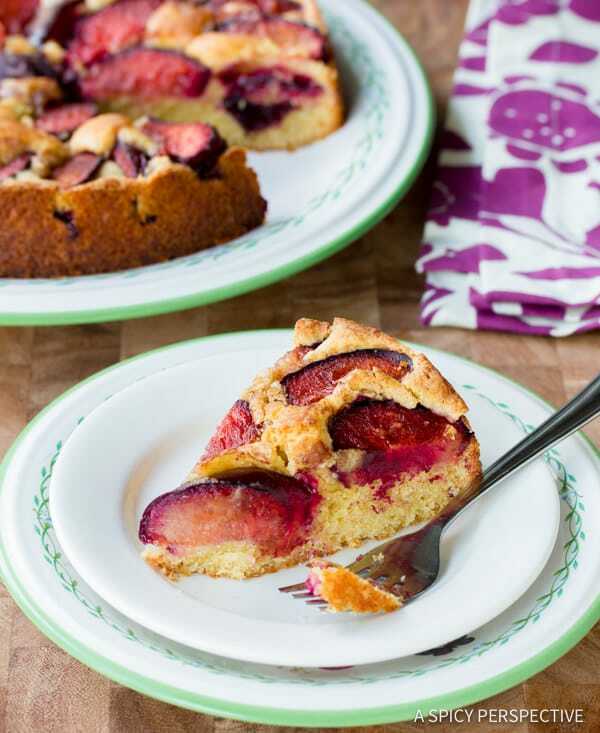 Plums are just gorgeous to cook with – I love how they bleed so beautifully into everything, especially cake! Your potos never disappoint and I just love that white washed table! The cake looks so pretty! And your kids are adorable! Great little helpers. Great photos and I love the plum cake. It wreaks of summer. ooo! That does look wonderful. I keep forgetting to buy plums but after looking at those pics of the plum cake I don't think I'll be forgetting them this week. I can't wait to bite into some plum cake! That is a work of art. I also just love your kids' aprons! This looks delicious and you have some great little helpers there! Hey Sommer, your little boy looks just like you-very cute! Oh, and the cake looks great too. That's a buttery, decadent cake! Sommer…that plum cake looks amazingly scrumptious. I make a similar apple cake like this too. Isn't it great how this cake lends itself so well in versatility. The good things in life are basic recipes like this that just make every memory that more special. Your special bakers are adorable ! Sommer,I swear in that picture they look just like you. They are beyond adorable:) What a wonderful cake…and what a fun morning! So sweet, kids and the plum cake, what a nice post, your plum cake looks amazing! Beautiful Plum Cake. Great to see your kids spending time with you in the kitchen. The plum cake looks delightful. It's great to have kids that enjoy cooking and baking too. Sounds like a fun time with the kids. The plum cake looks amazing. Would be great with a scoop of vanilla ice cream too! that is one beautiful cake!! I love plums and you really don't see them much in baked goods….I am always torn about leaving the skin on, but I think you just made up my mind to leave it on…your cake is perfect…. and your girls are so precious, I am so happy to hear they enjoy cooking with mom! OMG your kiddos are goregous!!! imaginary souffles, oh I would have cried also…I love plum cake..it's s perfect summer treat..great recipe.. Wonderful cake. Love the use of pumpkin pie spice. Lucky you have many willing helpers. Oh, your children are so adorable – they will forever be indebted to your culinary genius! ( ; The plum cake cake sounds so delicious, Sommer! Your kiddies made one beautiful cake! It looks so tasty and light. How fun… and so wonderful that they are budding pastry chefs! Your kids are so cool, yeah!! Your plum cake looks outstandingly beautiful!! MMMMMM,..I so love fresh plums! Lovely treat. No wonder why your kids love to be in the kitchen. OMG! What beautiful kids you have, they are adorable. And kitchen helpers…how lucky you are. This cake looks beautiful When I saw the first picture I was just wondering how the plum slices were all on top. Then thanks to your step by step, now I know. Its awesome. How cute are you kids?! I can definitely figure out the prankster from the exacting one. That cake is beautiful. Tell your kids they did some really nice work! wow great cake and so nice helpers. 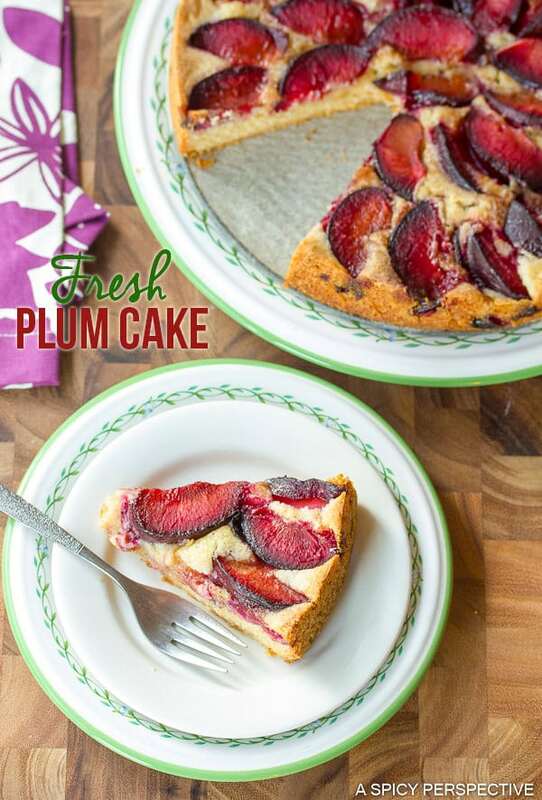 This plum cake looks fantastic! Gorgeous photos, cute kids and lovely cake. I'll be making this soon, as we are just about to be buried under a mountain of ripe plums from our trees. Thanks for the inspiration! 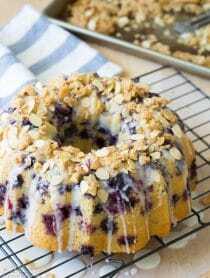 What a delicious cake and sweet helpers you have in your kitchen! I love any plum cake that doesn't ask for a yeast dough. Pumpkin spice sounds great in it. What fascinates me so about raising children is to notice the kinds of things they retain out of the mountain of concepts and information we try to pass on to them; cute that your child was impressed by soufflés! This photo shows the most adorable kids ever! As for your cake, I will be making it soon as we are getting a bounty of peaches, nectarines and plums from our orchard. Your kids are adorable, I cant wait for Indy to really bake with me. Tell the kids they did an awesome job! I've never made anything with a plum. You've all inspired me. I love plums. I could so see this with Plums, peaches and nectarines. That looks seriously good and your cut out circle is so neat! looks delicious! My kids love the kitchen too – it's always a great way to spend time together. Oh your kids are so cute with their little aprons! what a beautiful cake, especailly with the plums that are in season, I wish I could taste a slice right now, I am craving for something sweet! Plums and prunes are about in season here…love to use them make the coffee cake. Recipe bookmarked! Thanks! Oh my goodness! We use to make this when you were a tiny little thing living in San Diego. I know you don't remember it Sommer, but we made it with delicious California grown plums. We also made it with the local peaches or blueberries. It was a family favorite. I am so glad my precious grandbabies got in the photo shoot today.